Host a block party and reserve the wagon! 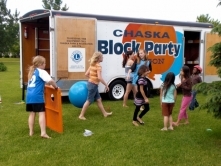 The block party wagon is available through the generosity of the Chaka Lions Club to Chaska neighborhoods. There is NO cost to use the Block Party Wagon; a $200 refundable damage deposit is due at the time of application. The wagon includes tables for 36 people, a 10 gallon thermos jug, street barricades, and a variety of yard games for adults and children. The Block Party Wagon is available for neighborhood block party gatherings only. One reservation per weekend May-September. The wagon is delivered Fridays and picked up on Mondays. Reservations for 2019 are on a first-come, first-serve basis.